Robotic automation systems are used for a variety of high speed automation or a multitude of complex actions. Dial-X Automated Equipment, Inc. works with all the major robot manufacturers, including IA/Intelligent Actuators and Epson, which are two of the most common manufacturers for these applications. 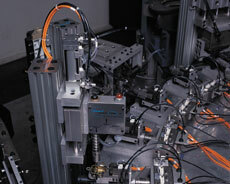 Robotic automation systems are beneficial when your throughput needs to be high and your accuracy needs to be perfect. Robotic automation systems can cut labor costs, while increasing parts-per-minute completion rates by using auto feed place for most component assembly. Robotic automation can be used for various applications, including welding, painting and assembly. Dial-X has the experience and flexibility to meet your exact robotic system needs. For further information or a free quote on robotic automation systems, contact Dial-X Automated Equipment, Inc.